My Contribution to The 70273 Project. Have you read the article on the New York Times about the trends in political fiber art, or “craftivism”? (I hate that word-it feels like it diminishes the work) The article’s an interesting summary of political fiber art since the 1970s. Click here for the full text. As a fiber artist and someone who has studied public policy, I admire the works of Sheila Hicks, Faith Ringgold, and Anni Albers. Art in any form can enlighten, or change someone’s mind, and cause a spark of empathy and recognition. As Toni Morrison said, All good art is political. While you may have heard of Threads of Resistance, which is showing around the country, there are two ambitious community fiber art projects with open calls right now. One memorializes a forgotten Nazi atrocity (this would not seem terribly political, and yet Nazis and white supremacists in the U.S. are feeling emboldened these days). The other seeks to have a conversation about the border wall. Neither one of these projects can be done without community participation. If one or both speaks to you, you have an opportunity to contribute. The 70273 Project by Jeanne Hewell-Chambers memorializes a forgotten Nazi atrocity, the murder of 70,273 disabled people. 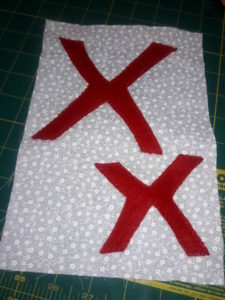 She is collecting a quilt block (two red x’s on a white ground) for each of those lost and has an army of volunteers helping her assemble them into quilts. Want to read more? Click here. I sent my block several weeks ago, in honor of my cousin Paul, who has Downs Syndrome. It is shocking that I feel compelled to take a stand against Nazis in America. In 2018. But there you go. On a related note, Lea McComas is working on a ‘quilted’ border wall project. If you are a quilter with an opinion (pro or con) on the planned border wall, you may want to participate. The online call is posted here: http://borderwallquiltentry.com/. The deadline for the call of 8″ x 16″ ‘bricks’ is July 31. 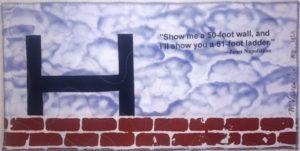 Lea is hoping to exhibit the wall in Houston in the fall at the annual quilt show. My contribution to the Border Wall Quilt Project. I am working on a large community fiber art project of my own. It’s not ready for prime time yet…stay tuned.